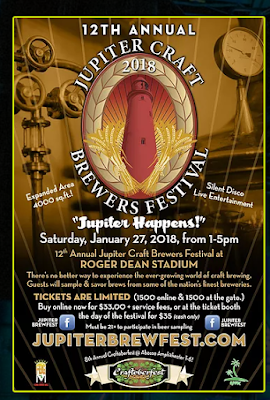 January 31, 2018: With baseball season right around the turn of the calendar page, and as spring training gets underway in South Florida, the 12th Annual Jupiter Craft Brewers Festival on Saturday, January 27, was a game-winner! 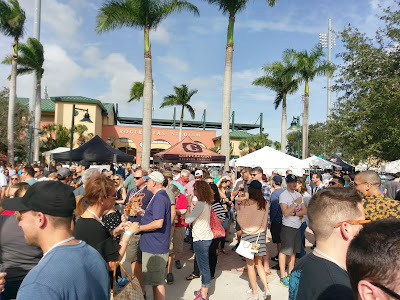 Once again, the pavilion grounds of Roger Dean Stadium at the Town Center in the Abacoa community of Jupiter played host to the South Florida beerfest with over 50 breweries and more than 175 craft beers in the lineup. Preceding the beerfest was the Ninth Annual Field of Beers brewery and chef food pairing event on Friday night, held inside the field. As in years past, tickets to Field of Beers sold out almost as fast as they went on sale in December (usually pretty close to immediately). The event was named the fourth best beer festival in the nation in a USA Today Readers' Choice poll in 2016. 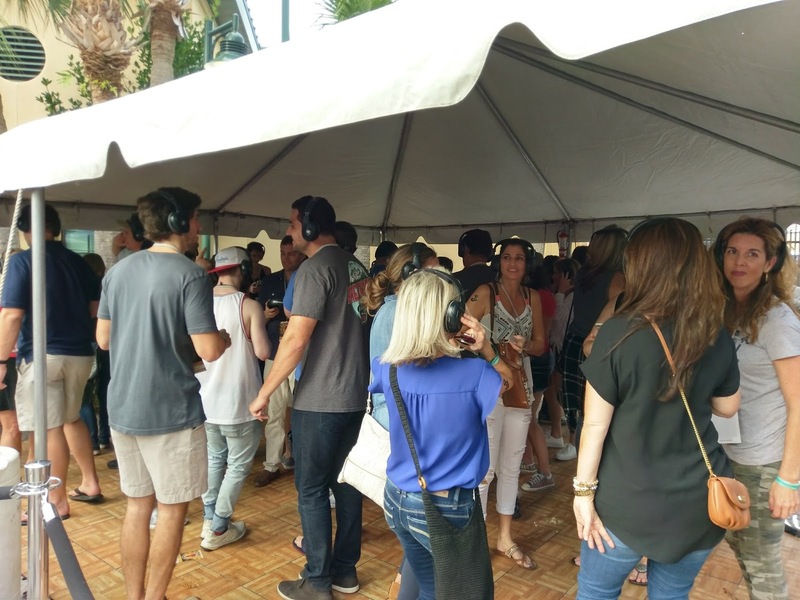 For those who didn't score tickets to the Field of Beers on Friday night, it seemed that Town Center bar Das Beer Garden was the place to be. And, with over 70 craft beers on tap and more in bottles, why not? The pre-fest party featured many brewers in attendance. About a block away, initial preparations for Saturday's beerfest had already begun. Saturday morning found the 20mph winds from the night before playing some havoc with fest set-up, but the crews prevailed, as things started to fall into place (maybe literally). A limited number of online tickets for Jupiter Craft Brewers Festival went on sale in December, and, as it always happens, sold out during the week of the fest. With around 1500 tickets available at the gate, beerfest hopefuls waited outside the fence well before the 1pm entry: maybe a little windblown, but they seemed to be having a good time in the low-70° weather. 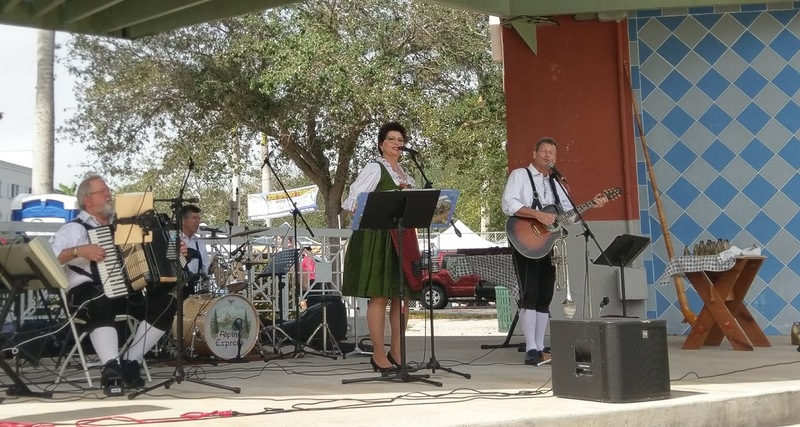 Meanwhile, across the street at the Amphitheater, the German band played, as the Craftoberfest family event oompah-ed into the afternoon. 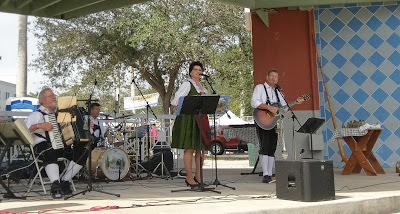 Craftoberfest is an alternative to the beerfest for those with families or who wanted to enjoy the sounds of Bavaria. Roger Dean Stadium is home to four minor league baseball teams, along with serving as the Spring Training site for the Miami Marlins and St. Louis Cardinals Major League Baseball teams. 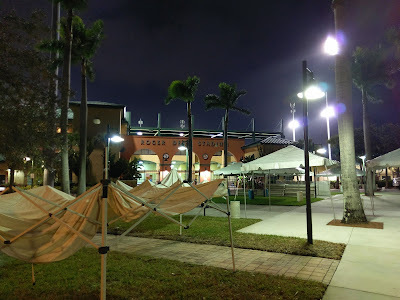 On the morning of the beerfest, it was tough to tell who was there for the beerfest and who was there for baseball tickets, as fans waited to purchase spring training tickets that morning. As the clock struck 1pm, and the stadium gates opened to let the beerfest crowd inside, there was already baseball activity on the field. Game On! 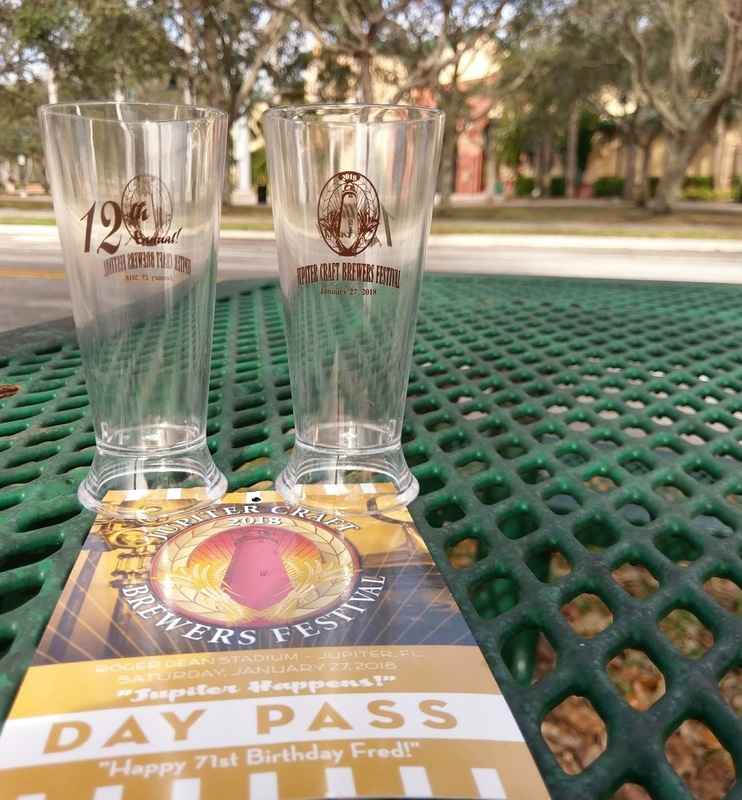 With beerfest maps in hand, fest attendees quickly began to fill their fest glasses. 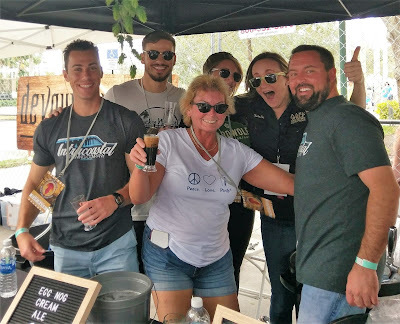 The fest featured a star-studded roster of breweries, many from Florida, with a strong South Florida representation. Because every beerfest simply must start off with a photo, and a lighter beer is usually a good way to begin, I found a Cream Ale at the Mathews Brewing tent (photos at top and below). 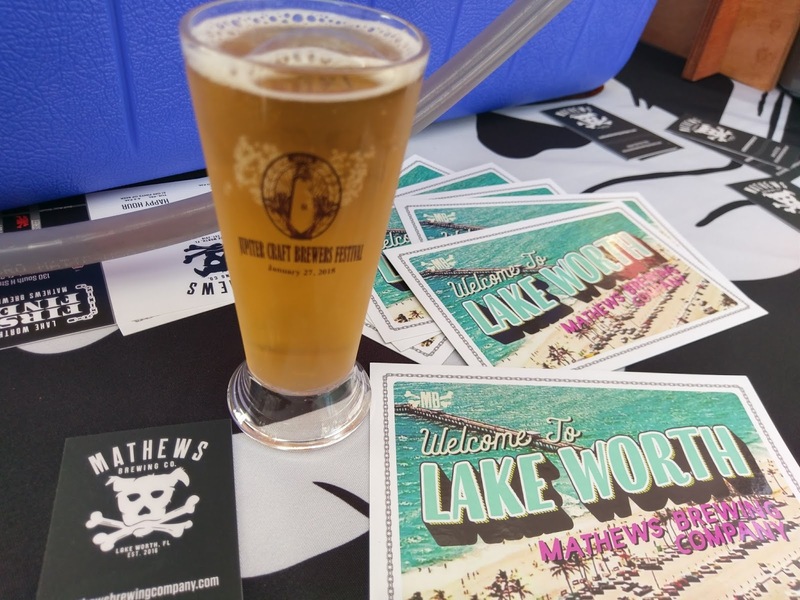 Mathews Brewing is a new brewery, which only opened in December in Lake Worth, south of West Palm Beach. I visited there a little over a week ago (new brewery visit alert: story on the way on that one!). 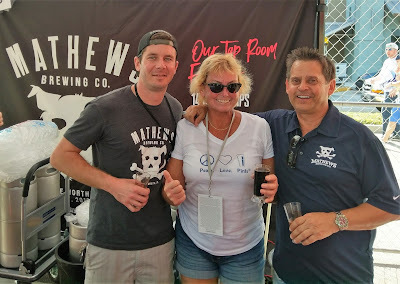 Later in the afternoon, I caught again up with James (Head Brewer) and Dave (owner). 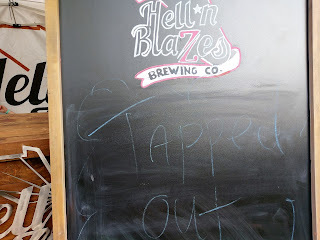 Although I had just seen them at their brewery, it was another fun visit! Congrats to Mathews Brewing! It's a pretty sweet visit there (more on that later). This, a Porter on Cask. The brewery has cask ales on tap. With 20 mph winds, it was a tough hair day. 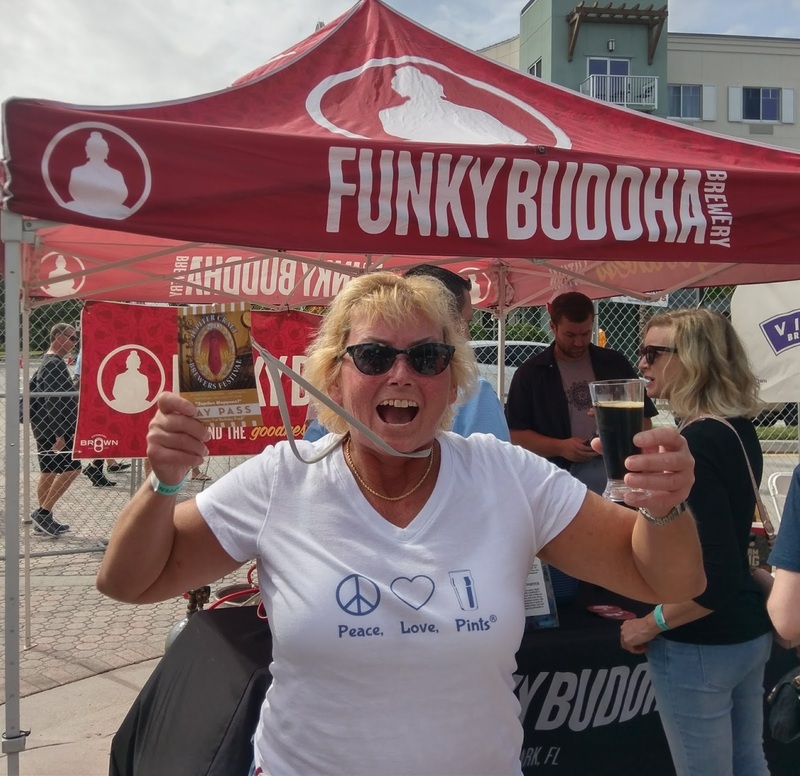 Making some news on Friday, January 26, was Funky Buddha Brewery, with the statewide release of its 2018 Maple Bacon Coffee Porter on draft, known as Draft Day. Bottles went into distribution this past Monday. The brewery had already hosted its annual MBCP Fest earlier in January. And, yeah, the MBCP was on tap at the Funky tent here, so that was the second stop. 2018 Maple Bacon Coffee Porter on tap and in hand. I'm always OK with getting a little funky. After that, there was no rhyme or reason for which beers to try next, but the batting order was stacked. There were so many new beers and a number of favorites that were also pretty tough to pass by. Each brewery poured between 2-5 beers each. 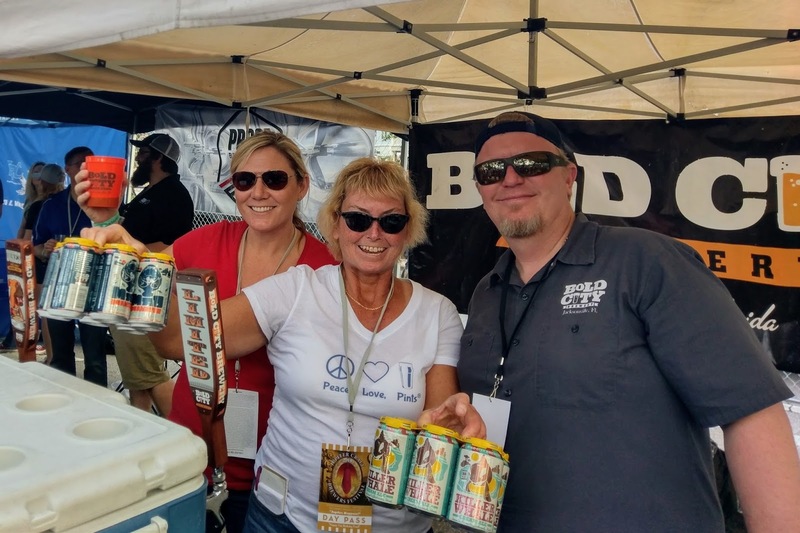 As lines began to form in front of brewery tents, sometimes the plan was to grab a beer and head to the next tent. Beer under the Florida Sunshine! 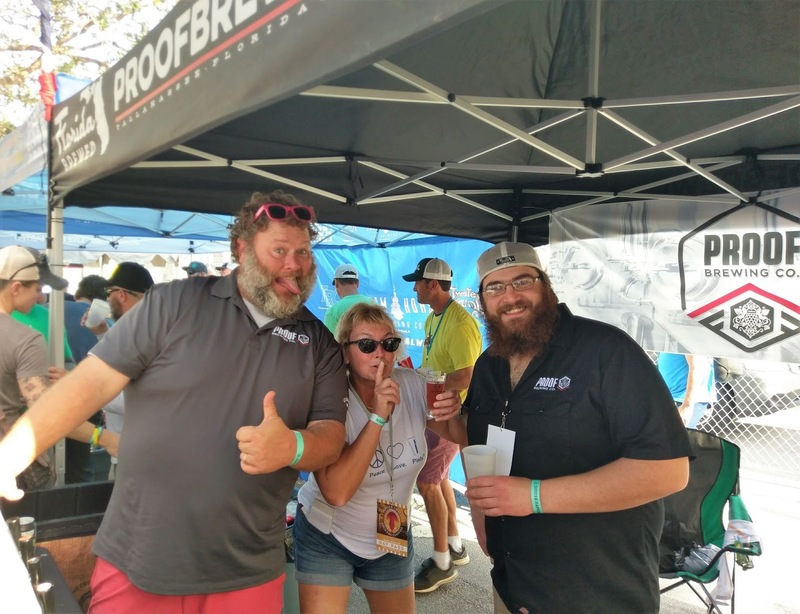 There's always a good time at the Intracoastal Brewing (Melbourne) tent at a beerfest (and at the tap room, too, for that matter). Intra poured several beers here, including a new Coffee Russian Imperial Stout, which, of course, had me at either Coffee or Stout. 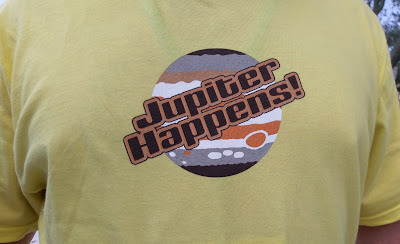 Unfortunately, I ended up wearing that one, as it got knocked over, and back in line I went. It was worth the wait! Another fun time at Intracoastal Brewing. And, crew from Aardwolf Brewing just happened to be there, too. This is my sixth time attending Jupiter Craft Brewers Fest, and this one holds a place in my heart because it's the first beer fest that I worked as a vendor back in 2012. I've only missed one since then - what's better than a weekend beertrip to South Florida at the end of January? 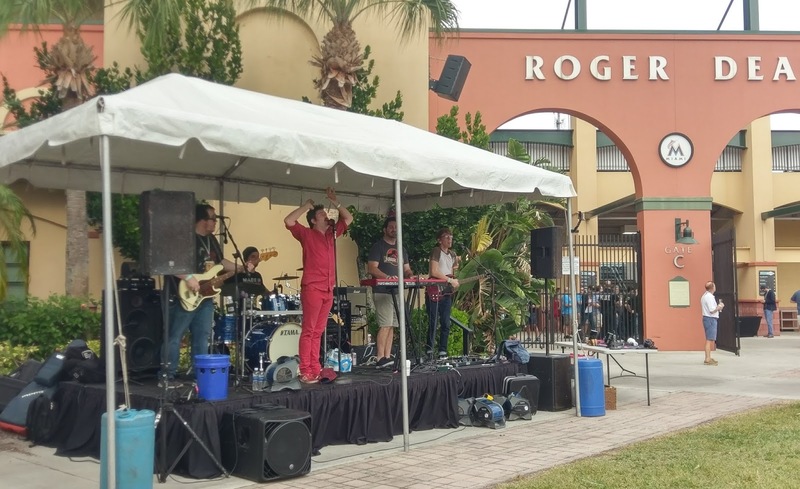 Last year, there were a few changes to the physical set-up, with the addition of a central seating area with tables and chairs and an enlarged live music stage with additional seating. The place was rockin' all afternoon! And, then there were more brewery visits! With a base in North Florida and the Jacksonville area, I made sure to stop at the two Jax breweries here, Aardwolf Brewing and Bold City Brewery. Over at the Bold City Brewery tent, there were even some boisterous chants of that now-infamous DUUUUUUVAAALLLL made popular with the Jacksonville Jaguars® banner year -- not sure if those guys were from the Jax area, or if they were just getting in the spirit of things with Bold City. By this time, depending on how you look at it, the fest was more than half-way over, or there was still half a fest left. In addition to the live music, the Silent Disco is always a popular place to be. they were movin' and makin' some noise! 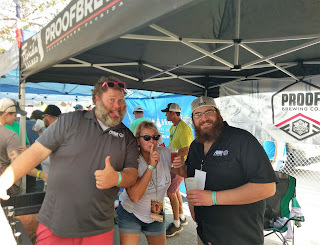 Over at the Proof Brewing tent, I was able to get a pour and hang out with another fun crew for a while. Fruit Punch Evil Kiss Berliner: cherries, pineapple, orange, lemon. What's not to like about that? These guys, being, well, these guys! 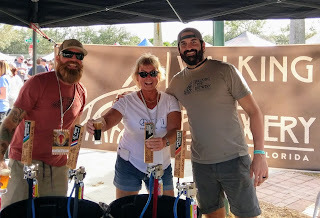 At last year's fest, Walking Tree Brewery (Vero Beach) was a new brewery, only having been open just over six months at the time. What a difference a year makes, as the brewery subsequently picked up a cadre of awards in 2017. 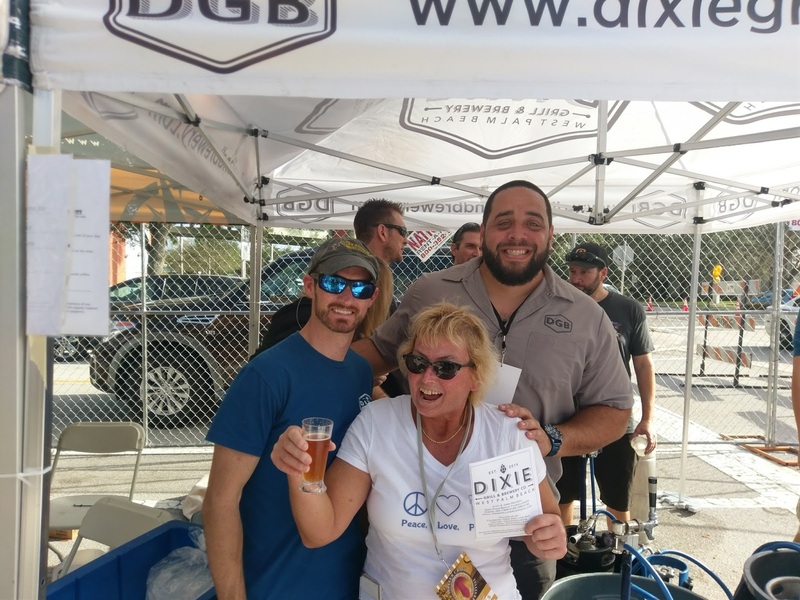 The brewery announced over the weekend that it will begin expanded distribution into the Jax market in early February. I stopped by the tent a few times, including at the 3pm tapping of Duke Snider's Imperial Stout. All smiles at Walking Tree Brewery! 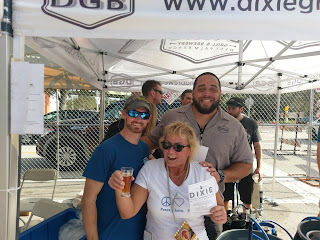 One place that I've noted for a while but haven't visited yet is the Dixie Grill & Brewery in West Palm Beach. With over 30 craft beers on draft, along with its house beers and appetizing food menu, this is one to keep on the radar for a future visit. Dixie Grill is on my list! Fun group, too! In addition to sampling so many beers, it's also cool just to talk to other attendees. 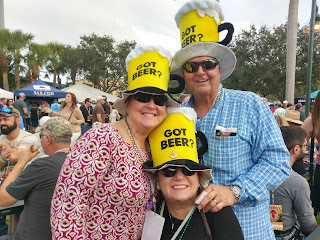 This group was in the beerfest spirit! Beerfests are also a great way to find new breweries. 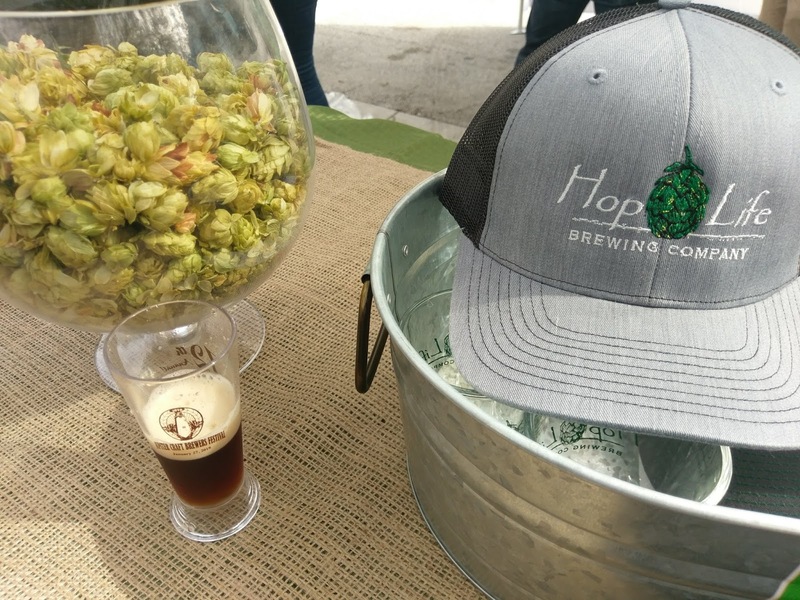 Among one of the newer Florida breweries is Hop Life Brewing in Port St. Lucie. With a location just off of I-95 near the baseball stadium, this sounds like another one to check out. if you like nuts, you'll love this one! With an hour to go, the beerfest was in the seventh-inning stretch, as the kegs had started to run dry, and some folks made an early exit. 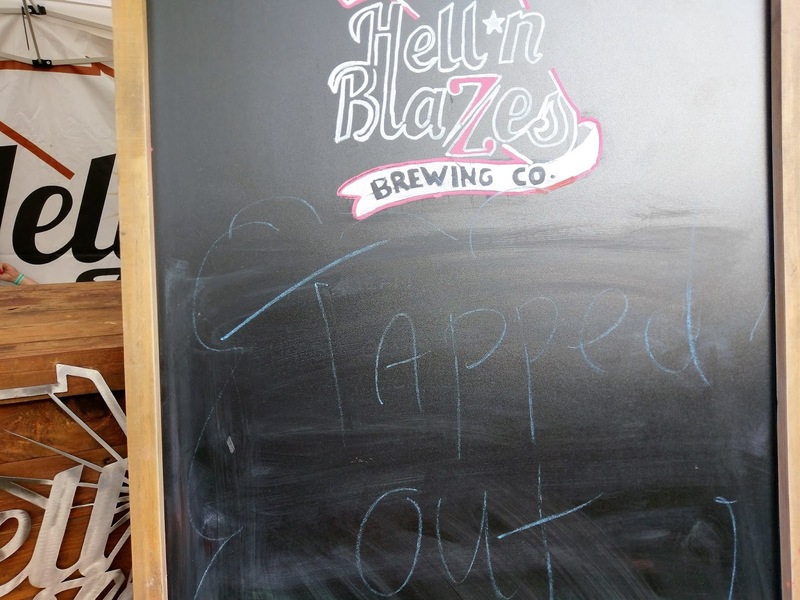 Hell 'n Blazes Brewing (Melbourne) was rockin all afternoon. 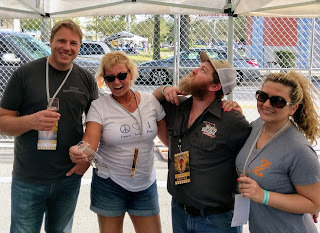 With an empty glass, I ran into David from Tampa Bay Brewing Company and Todd from Hell 'n Blazes under an open tent. Not quite calling it a day, yet. Wait a minute, I need another beer! Always great catching up with these guys! As the late crowd made its last efforts in search of beer (always an "interesting" time at a beerfest), the grounds started to feel a bit empty. 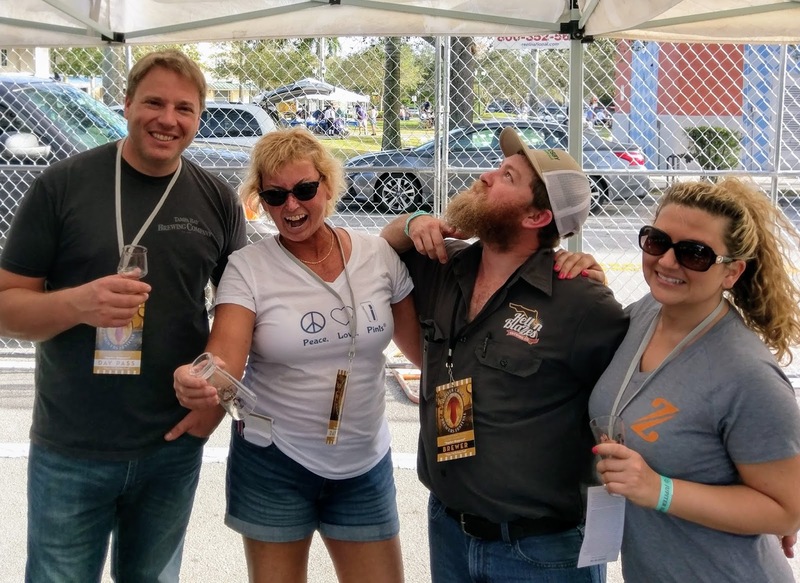 And, then, crews started take-down, and the 12th Jupiter Craft Brewers Festival was history. Organizers Fran Andrewlevich and Jaime Meholic hit another game-winner. 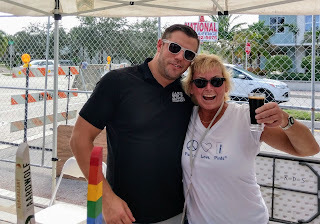 During the morning, I had a chance to chat briefly with Fran, who was busy running around with some set-up matters (but then, he's always busy: with Tequesta Brewing, Twisted Trunk Brewing, and the new Steamhorse Brewing coming on board soon). He reminisced about the early days of the fest, held at the adjacent amphitheater. This fest is a hit with the brewers and attendees alike. As Fran explained last year, there is no VIP early entry, and everyone just gets in there and has a good time. As the shirt exclaimed: Jupiter Happens! A portion of the proceeds from the fest benefits the Autism Project of Palm Beach County, an organization founded by parents to help fund initiatives designed to support those with autism and their families. 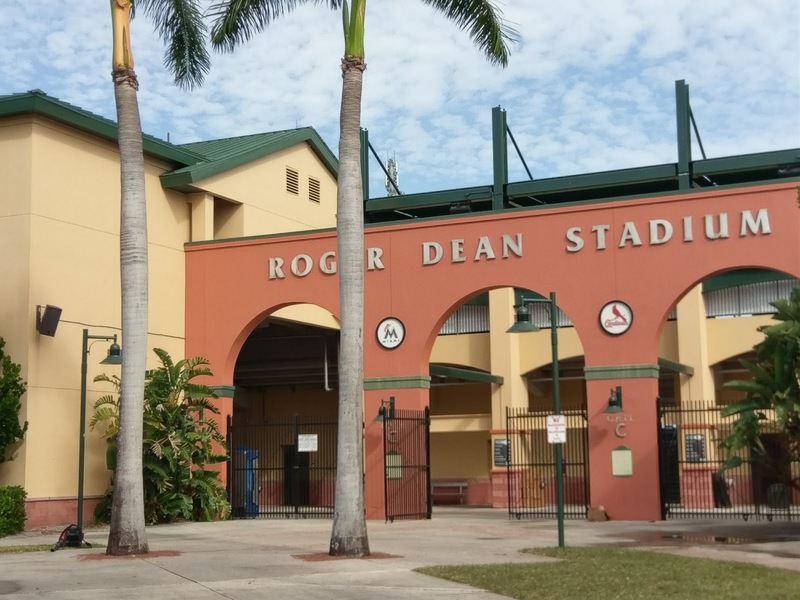 Sunday morning brought an entirely different feeling to the grounds of Roger Dean Stadium, as the only remnants of the fest were some clean-up activities. 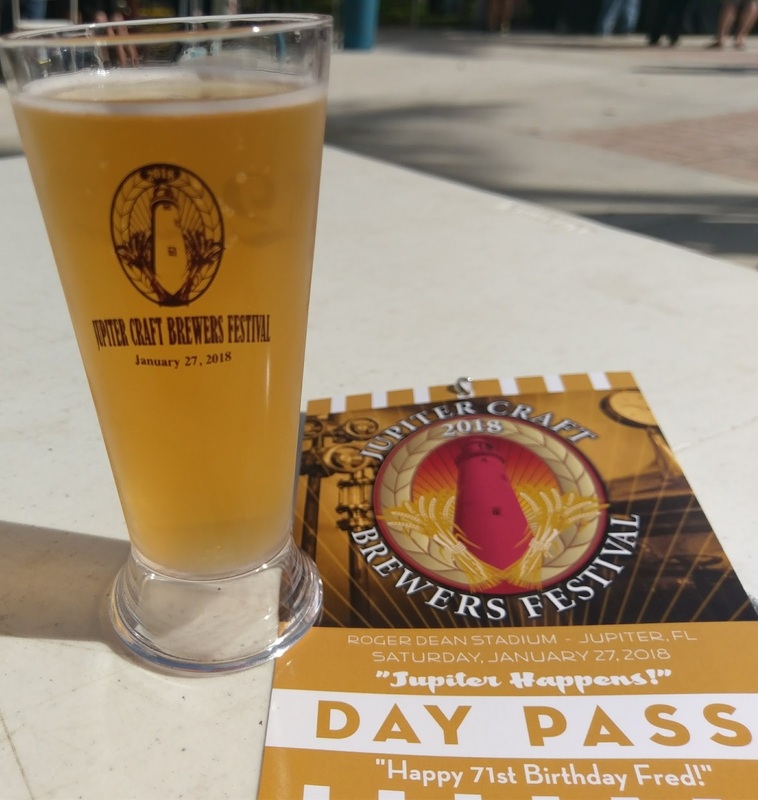 Jupiter Craft Brewers Festival is always on my beertrip list! 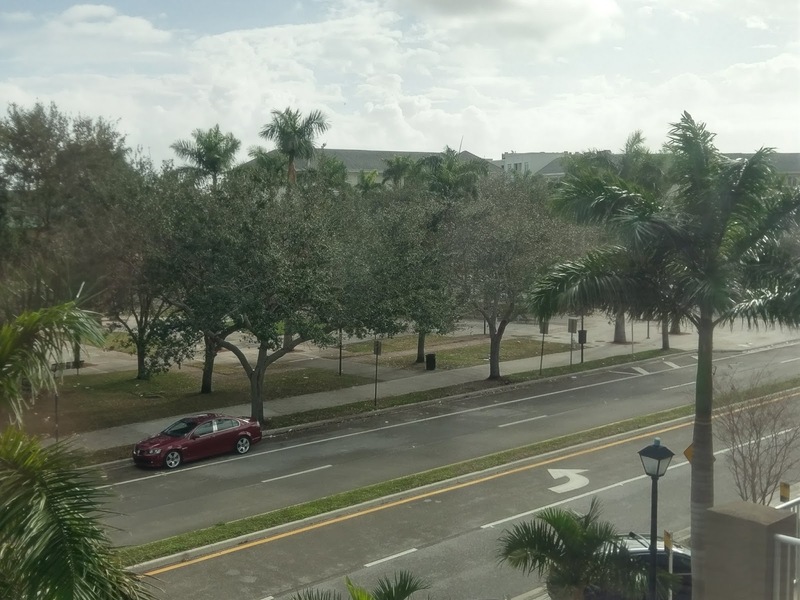 Abacoa is a great destination in its own right, with the Spring Training and Minor League Baseball games, along with an awesome golf course in the community. 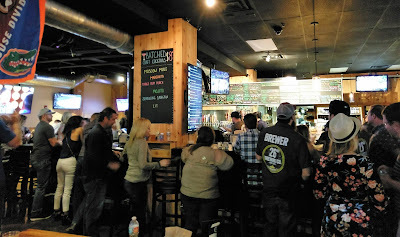 The Town Center is also home to Civil Society Brewing -- and, yes, I made another stop there over the weekend! In addition to Das Beer Garden, there are also several other bars and restaurants, which are recurring stops, as well. Sure, 2018 is only just getting started, but when December comes back around, keep your eyes open for tickets for the 13th Annual Jupiter Craft Brewers Festival in 2019! 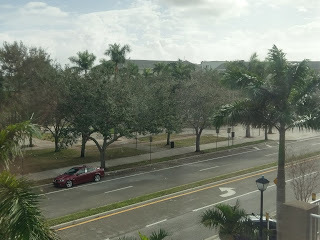 What another great weekend in South Florida! 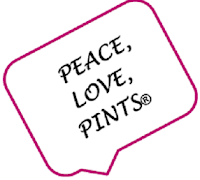 I also made another new brewery visit, so stay tuned for two new brewery visit articles still on the way. In the meantime, check the calendars on brewnymph.com for more beerfests in February, March and April!